Keeping the diverse requirements of customers in mind, we are instrumental in providing Plastic Folding Table. Plastic Folding Table we "Decorative Interiors" Extensively used for both indoor and outdoor cafeterias, our Folding Table are available in various types. These legs are mostly used with circular or curvy table tops and are easy to fix in. Features . Easy to operating & steady. Non breakable .Multi Table . Laptop table - Multi study Table . T-poi -5 steps Heights Adjustable - Mini Dining - Total Fold for picnic Purpose - Washable Base - Light Weight and Portable - Weight 5Kg .size 2x1.5.make in india. 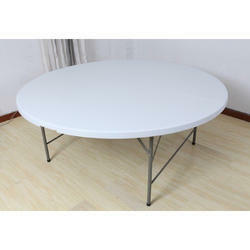 Folding Plastic Table with Powder Coated Frame. Imported high quality, blow moulded, round table (4 ft diameter x height 29-1/4") with digitally welded foldable strong iron tube legs, clamps and locks-a special solution especially for the catering segment, restaurants, banquet halls and clubs.